When working with JUnit 3.8.x, one usually has a TestSuite (often named AllTests), which contains all indivdual test cases of a Java Project. Especially when dealing with a large number of projects, it is hard to ensure that every single test case is included in an AllTests suite. Sometimes one encounters a test case and wonders why it is not executed on the continuous integration server. However in most cases, one just won't recognize. I wrote a little Eclipse plug-in that addresses this issue. 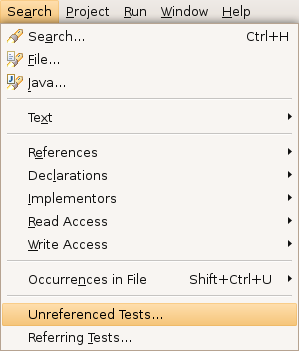 It searches all projects for test cases that don't have any references in the workspace. The plug-in can be downloaded here. Notes: This plug-in is not applicable to JUnit 4; The plug-in does not handle more complicated scenarios, e.g. a hierarchy of TestSuites.